Occupational psychologists contribute across a range of areas in the work domain: psychological assessment (including recruitment and selection); learning, training and development; wellbeing; work design; human-technology system design; organisational change and development; and leadership, motivation and engagement. In recent years, occupational psychologists representing the British Psychological Society have promoted approaches to culture change within the NHS in responses to the Francis Report, developed guidance for improving the environmental responsibility of organisations and considered assessment centre standards. But how is their role changing, and what does the future hold? The world we live in has become increasingly well-connected and integrated, and will only become even more so. Rapid advances in technology have enabled companies to compete in the global economy in addition to local and national markets. Information technology has created the communication network to facilitate the expansion of products, and the sharing of ideas and resources among people regardless of geographic location. This creation of efficient and effective channels to exchange information has been the catalyst for globalisation. Organisational learning has been identified by experts such as Tomas Hult as an important factor for organisations to achieve a competitive advantage in dynamic markets. It is crucial for employees to continue to learn new knowledge if a company is to remain current. When employees gain new insights, they are able to incorporate these into products, processes and services, and empirical studies by Joaquín Alegre and Ricardo Chiva have suggested that such new knowledge is the basis for innovation. Organisations that value employees’ learning can expect to be more innovative and competitive in the marketplace. Technology has had a massive impact in the way learning is taking place. Digital learning now encompasses webinars, ebooks, massive open online courses (MOOCs), social media and online communities, podcasts and microblogging. Learning in organisations can now take place in virtual classrooms, learning simulations and games, and apps on smartphones and tablets make learning on the go possible. Learning has become more integrated with work with the use of shorter, more modular ‘just-in-time’ delivery methods. Companies like PepsiCo have incorporated digital learning into their strategy; learners complete a course together by taking sections of the same e-learning on their own and then meet every couple of weeks for discussions. This is designed to allow a group of learners to complete a course virtually. This enhances the process of knowledge to be transferred through social and collaborative means. This is an example of the ‘flipped’ classroom model, where the knowledge transfer is done online asynchronously with the discussion on that learning done face-to-face. Another recent development is the use of game-based platforms and virtual reality (VR) tools. Gamification is defined as taking the essence of game-attributes, such as engagement, transparency, design and competition, and applying them to a range of real-world processes inside an organisation, for example leadership development. Deloitte have used gamification to engage leaders in training and experience what it means to be a leader. It has created a virtual academy that contains video lectures, in-depth courses, tests and quizzes. Learners are awarded badges for completing each online learning, which then puts them on a leaderboard, thus encouraging peer competition to be at the top! With avatar-based tools, learners are able to create visual representations of themselves that engage the learner with the ability to explore and manipulate objects, structures and metaphorical representations of ideas. These technologies create simulated environments that have the potential to offer a superior learning experience through increased ‘representational fidelity’ realism of the environment, ‘immediacy of control’ by the user, and a sense of ‘presence’, thus leading to higher levels of active learner participation. 3D virtual environments have been used to train nuclear power plant workers in Japan, to teach astronauts how to repair space telescopes, and to train surgeons on a variety of medical procedures. There’s clearly a world of opportunities to enable learning through these technologies. However, care should be taken when using VR platforms: a number of studies have found that learners can have difficulty navigating hypermedia environments, becoming ‘lost in hyperspace’ with no idea of how they arrived at a node and no clear model of the overall environment structure. Head-mounted displays for some VR platforms can also lead to headaches and nausea in some when used over a prolonged period. Whilst digital learning platforms allow access to a vast amount of information and ‘just in time’ learning, it does need to be appropriately presented and resourced. Making digital learning available to unprepared and unsupported learners is unlikely to be effective. Learning needs to be relevant, high-quality, focused and tailored to individual needs. If it’s not, learners are likely to switch to ‘mental autopilot’. With online text it is easy to get distracted, following links from pages and flitting between different courses and sites. In her 2011 paper on the neuroscience of learning, Sylvia Vorhauser-Smith explained that without focused attention, learning is not embedded. It is important to revisit previously learnt information and find opportunities to teach, summarise or do tests to see what has been learnt. Information should be chunked into smaller pieces of learning, and spacing out learning sessions has been shown to have lasting benefits on long-term information recall (with a 2014 review led by Josh Davis, Director of Research and lead professor for the NeuroLeadership Institute, ‘Keep an eye on the time’, suggesting that a 12-hour gap that includes sleep is particularly effective). Further research needs to be conducted in this area to explore how humans learn in digital environments. There is no longer heavy reliance on authority-based lecture mode, rather interaction and acquisition of knowledge are increasingly impersonal. Some of the major learning theories (behaviourism, cognitivism and constructivism) do not take into account how learning occurs via the medium of the web: with less reliance on the ‘authority-based’ lecture mode. We now use more abstract, textual, visual, musical, social and kinaesthetic intelligence, and this will impact the way humans naturally learn. In a world where organisations are continuing to develop talent and drive performance, initiatives that tap into how humans learn will benefit them greatly. Occupational psychologists can help by understanding how learners engage and learn in different digital environments, which in turn will influence the design and delivery principles of digital content learning. Old learning frameworks and their theories will need to be redefined for this new digital era. The scenario is familiar. Low-skilled jobs have been replaced by shiny bots and flying drones. Even some ‘white-collar’ jobs have begun to be replaced by computers endowed with ‘machine learning’ – using sophisticated algorithms to work out what to do, rather than needing to be pre-programmed (see Martin Ford’s 2015 book The Rise of the Robots). But the consequences are startling: a ‘hollowed out middle class’ – with workers using high-end judgement-based skills (and the trust-fund wealthy elite) separated from a poorer low-skilled underclass. With fewer people able to buy the products and services, the assumptions underlying monetary systems will be shaken, unless radical new thinking gains ground. Coming soon to an economy near you! If this scenario, or a version of it, is anywhere near correct, we can think about two important themes. Firstly, the skills to be valued will be those that can’t be replaced by computers. Instead, we’ll need ‘genius’ thinkers – those that can make connections, see things in new ways, and visualise the import of available information (see creativity expert Michael Michalko’s 2007 article ‘How geniuses think’). Secondly, at the same time, technology will make many tasks – writing reports, say, or finding information when it’s needed – so much easier. Modern software is able to turn speech into text and commands much more fluently than before. Words can be read from the screen – and even from photographs – to allow those who struggle with reading to take in information more easily. In short, we will be creating conditions for neurodiverse people to come into their own. What are the strengths that neurodiverse people often have, which could be more valued in future workplaces? We now turn to just a few examples. Beta testing software needs someone with powers of concentration and a literal mind; someone who can concentrate well and (preferably) who doesn’t need social distractions. An autistic person might fit the bill nicely (did you see the example of this on BBC2’s documentary Employable Me recently?) One employer, quoted in Thomas Armstrong’s 2010 book Neurodiversity, found their fault rate dropped from 5 per cent to 0.5 per cent when these tasks were given to autistic employees. Creative energy often characterises those with attention deficit hyperactivity disorder. (Perhaps in this working future, these individuals might be labelled ‘creative energetics’ instead of ADHD?) Useful in work environments where ideas are prized, these individuals could make future inventors, entrepreneurs, entertainers, advertising specialists, architects… Some of these roles have also been shown to favour dyslexic thinkers; their visual thinking allows new possibilities and solutions to be worked through. Many successful business people such as Sir Richard Branson, Elon Musk, Steve Jobs, Sir Alan Sugar and (Lord) Richard Rogers have spoken out about dyslexic talents. Research from Julie Logan at the Cass Business School, published in 2009, discovered that whilst the prevalence in the general population of dyslexia is around 10 per cent, only 1 per cent of corporate managers are dyslexic, compared with 20 per cent of UK entrepreneurs and 35 per cent of US entrepreneurs. Companies such as Ernst and Young have hence devised a specific mentoring programme to support dyslexic recruits through the lower rungs of the corporate ladder, such that they might survive to the top, to diversify leadership thinking and avoid strategic ‘groupthink’. As psychologists, we have a role to play in this (and it’s a role some of us are already taking on). We need to understand neurodiversity, and research this area to provide solid evidence of the talents; and we need to educate ‘the public’ to understand neurodiversity too. We need to report on strengths, as well as struggles, during cognitive assessments, and make sure these are understood in a career context rather than as pseudo-medical deficits (a point considered in McLoughlin and Doyle’s 2017 British Psychological Society report Psychological Assessment of Adults with Specific Performance Difficulties at Work). We need more research into the effectiveness of reasonable adjustments, such as technology, sensory-overload management and flexible working practices, so that we can give evidence-based recommendations to employers. We need to ensure our policymakers not only understand it, but actively intervene to help this group use their talents in the workplace. We need to help the neurodiverse understand their talent areas, and we need to help employers to make their workplaces non-disabling, talent-valuing places for the neurodiverse to shine. Our economy needs nothing less. Unless new business models are developed, we are heading for an increasingly unstable and unsustainable world. One way of adapting is to advocate and promote behavioural change models aimed at individuals and organisations. A second is for occupational psychologists to advocate and help develop competencies and resilience needed to cope with change. Work exists in organisations that operate in an ever-changing environment of politics and the law; a global economy; social and demographic changes; technological advances; and our physical environment. The current forecasts that will impact on organisations and individuals include a world population of 9.7bn by 2050; an average global temperature rise of between 1.5 and 6ºC by the end of the century; and freshwater consumption to rise by 25 per cent by 2025, with two thirds of the world’s inhabitants living in water-stressed countries. In 2014 the Global Footprint Network estimated that if everyone in the world were to consume natural resources in the same way as an average European, we would need three planets to sustain our current consumption levels. These are global impacts and will be felt locally in the supply chains of all organisations. To achieve sustainability at work, they need to respond in ways that mitigate, adapt and enable them to remain resilient in times of change. In the words of the British Standards Institution, they must display the ability to ‘anticipate, prepare for, and respond and adapt to incremental change and sudden disruptions in order to survive and prosper’. Corporate sustainability requires businesses to design strategies that not only focus on maintaining their financial status but also generate returns for society and the environment. Making a profit at the expense of our environment or people will no longer be tenable. New business models are being developed to ensure the long-term efficient use of resources and energy. This can be seen in the current successful mitigation activities of divestment and reinvestment from fossil fuels to renewable energy by pension funds, which can be both an organisational and a personal action. Susan Michie’s COM-B model of behaviour change, used in organisations such as the NHS, identifies the capability, opportunity, motivation and behaviours necessary for change. Currently this approach to interventions is leading to waste reduction and energy savings in a range of retail and manufacturing companies. • Circular supply – where scarce resources are replaced with fully renewable, recyclable or biodegradable resource inputs. • Resource recovery – where waste materials are reprocessed into new resources. • Product life extension – where material that would otherwise be wasted is maintained or improved through remanufacturing or repair. • Sharing platforms – sharing products and assets with low ownership or use rate. • Product as a service – customers use products through a lease or pay-for-use arrangement. As individuals, we already use some of these daily – such as car share schemes and Airbnb. At work we could seek more ways to share resources to become more efficient – with additional social and wellbeing benefits as we collaborate more with our colleagues with opportunities for learning from, in Etienne Wenger’s words, ‘action and connection’. Organisations may also have to adapt to changing conditions, or the threat of them. More extreme weather conditions and changing from a fossil fuel economy will create global risks with local effects. Employees will be expected to have the personal resilience to adapt to new ways of working – combinations of new goals, systems and processes. Helping individuals develop their resilience with a sense of purpose, competence, adaptability and social support is one way that psychologists can help to successfully implement these changes. An example of this is from an intervention for part of the NHS delivered by Robertson Cooper using their ‘I-resilience’ model. Using pre- and post-measures, perceptions of workplace pressures were found to have all improved significantly along with general levels of resilience. It is anticipated that over a longer period of time, the impact on wellbeing will also improve as employees get used to a more resilient way of dealing with workplace pressures. 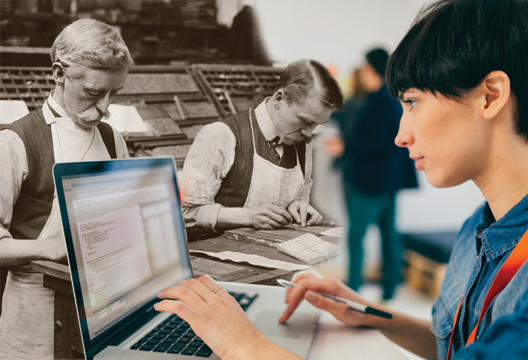 The employment environment is constantly changing in every possible way, and yet workers face many of the same problems that challenged their equivalents in the middle of the 20th century. Economic factors are an ever-present: when it comes to wellbeing in the workplace, we know what we should and could do, but the financial bottom line often eats away at best practice. It could seem that society takes one step forward, two steps back. So how can psychologists make their voices heard? When it comes to supporting people with health problems, people turn to the health professionals; in psychology terms this might be a clinical, neuro- or health psychologist. Yet occupational psychologists are more likely to be involved in designing healthy places to work, or executive coaching to help managers build resilience and manage stress at work. Equally, times are changing. In years to come, we predict there will be less of a divide between managing health at home and managing health at work. There are many new schemes appearing that promote and support a healthy working nation, alongside research that shows the negative effects on mood of being out of work. There’s a strong drive to encourage people to return to work as soon as possible after ill health. There is much more we could be doing to support both employers and employees here: a report published by the Council for Work and Health discusses the need for more psychologists from all domains to be involved in the occupational health arena (tinyurl.com/y7ravvz3). Within the British Psychological Society, the Division of Occupational Psychology’s Psychology of Health & Well-Being Working Group will be working closely with the new cross-divisional BPS Work and Health Group. So, what are the main issues around wellbeing that will face us in the changing workplace? Changes in legislation around retirement age and the timing in relation to the career stage of ‘baby boomers’ (people born between the years 1946 and 1964), presents businesses with the challenge of meeting the demands of people with very different values, expectations and needs when it comes to managing their life goals and pressures. It is anticipated that by 2025, 75 per cent of the workforce will be Millennials (people reaching young adulthood around the year 2000: tinyurl.com/ydxq63pm) and Barbara Eversole and others have written about the need to create a flexible organisational culture to attract and retain talented workers across generations. The increasing state pension age will also result in an ageing workforce, who are increasingly likely to want to work flexibly towards retirement (see tinyurl.com/y7ggd3w8), and an ageing population is likely to place additional caring requirements upon workers with elderly relatives. Combined with the childcare responsibilities of working parents, this represents increasing demands outside of work that may impact a higher proportion of the workforce, which has implications for managing wellbeing. The changing generational profile of the workplace may also suggest a growing need for a different psychological contract. Lauren Lee Anderson has written about how Millennials value autonomy and independence at work, which is often reflected in a desire to work outside of typical office hours, in contrast to the desire for security and structure of older workers (tinyurl.com/y9hfw6jt). As ‘digital natives’, they are used to staying connected to the world through social media on smartphones and tablets at any time or place. Writing in the Journal of Management Psychology in 2008, Lucy Cennamo and Dianne Gardner discussed these generational differences in work values, outcomes and person-organisation values fit: the question of how employers can create a psychological contract that reflects Millennials’ preferences for freedom, status and social involvement remains a pressing one. Coming up behind the Millennials are ‘Generation Z’, born from the late 1990s onwards. They are reported to differ from Millennials by showing more interest in volunteering and making an impact on the world (see tinyurl.com/hvkrr5m). Organisations will need to find ways for employees to demonstrate these values within the workplace, if they are to attract and retain young talent, whilst maintaining their engagement and wellbeing. As well as changes to the workforce, there have been recognised changes in the macro-environment that have created a complex landscape for businesses, with barriers to positive wellbeing. Enhanced technology and social media allow connectivity regardless of location and time zone, giving workers continued access when working remotely or even when engaged in non-work activities, therefore allowing work and life to become ‘enmeshed’. He Lu Calvin Ong and Senthu Jeyaraj have discussed the differences between work–life balance and work–life harmony in this respect, the latter visualising work and life roles as being interconnected and dependent on each other, rather than separate and in competition. There’s one final area we would like to highlight: health and safety in the workplace, where occupational psychology has been hugely influential. If one single issue underpins the UK’s dominant position in the world of health and safety it is that, based on the core tenet of the Health and Safety at Work Act, it focuses on the objective and dynamic assessment of risk rather than a ‘compliance to avoid litigation’ model seen elsewhere around the world. This is underpinned by a proactive prediction of where things are likely to go awry. The field quickly embraced the world of occupational psychology in seeking to understand the person–environment interface and the 1001 ways it can go wrong! Safety leadership courses often start with the ‘fundamental attribution error’ (that we systemically give too much weight to individuals and not enough to environments when things go wrong). Based on Manchester psychologist Jim Reason’s ‘Just Culture’ model, systematic analysis can show how subtle cues and signals influence the workforce perception of what management really want, and hence their behaviour. Advanced influencing skills (see Robert Cialdini’s work), behavioural economics (the ‘nudge’ concepts of Cass Sunstein and Richard Thaler), problem-solving in teams, communication skills and even transactional analysis come into play. In short, it’s often said that ‘compliance is but base one’ – occupational psychologists are heavily involved in all bases on from there. (An illustration: Jim Reason is widely agreed to be the world’s most influential safety writer.) The big challenge is to ‘thought lead’ around the world and bring other nations up to speed in the safety arena, and also to apply the learning to mental health and occupational illness. For every person killed in an accident in the UK, 50 working people will kill themselves and 120 will die of illness due to exposure at work. Psychology must contribute to discussions around the interconnected issues of productivity, misery, wellbeing and motivation. The labour market we face today is challenging to navigate, as a consequence of being less structured and more flexible. Vicki Smith and others have written about how this ‘turbulent unpredictability’ tends to favour organisations, while not necessarily suiting the needs of individual workers. The ‘boundaryless career’, in Michael Arthur and Denise Rousseau’s terms, in which individuals must take responsibility for managing their career (e.g. keeping skills up to date, planning career progression, identifying opportunities) is often described in terms of individuals escaping the restrictions (e.g. on careers) of organisations. Yet critical voices (for example Kerr Inkson and colleagues) have observed that there are often contextual constraints that may present barriers to career success for marginalised workers, such as women, ethnic minorities and those in low-skilled jobs. So while the flexible job market is good for organisations, and for those who are able to progress from one opportunity to the next, others will be left with unemployment, underemployment and precarious employment. It should be noted that while the boundaryless career is sometimes assumed to be the new default career model, Ricardo Rodrigues and David Guest have suggested there is poor evidence for the end of traditional organisational careers. We cannot assume that career progression strategies will be the same for everyone, and we need to be aware of the context surrounding the sectors in which people work. I will, however, focus on discussing the more precarious employment future facing many, and the implications of this for psychological practice. It is often assumed that job security does not rest within a single organisation (which may terminate employment to reduce costs, or may face unexpected catastrophe), but with an individual’s ability to adapt to market conditions, such as by being able to seek reemployment, or transitioning between organisations, job sectors or nations. ‘Career adaptability’ has become a key concept, particularly in the work of Hirschi et al. Thus attention has shifted from employment to employability, which Andrew Rothwell and John Arnold have defined as the ability to gain and maintain desired forms of employment, and others consider a set of understandings and experiences that enhance career success. Vicki Smith has identified a number of strategies that individuals may use to enhance their employability: engaging in unpaid (i.e. volunteering) or poorly paid work to gain experience, training and networking to build human and social capital, and engaging in ‘identity work’ in order to develop professional values and behaviours that will be recognised by employers. This raises some ethical issues: the frequent advice to engage in unpaid work may unintentionally exploit the labour of individuals with precarious careers, but may also exclude marginalised groups (e.g. working-class individuals) who cannot afford to engage in unpaid work. Furthermore, as the responsibility for career management shifts to individuals, so too can the costs for developing the skills that organisations wish to acquire. In a 2012 review Michael Tomlinson outlined how higher education (HE) has been increasingly treated as a method for improving the employability of individuals. However, with growing numbers of graduates, a degree is no longer a simple passport to career success. At the same time as demand for HE has become nearly universal, governments are typically requiring individuals to contribute more to the cost of their education. In other words, students are paying more for education that is often assumed to be a route to career success, whilst the ability of HE to facilitate this success is becoming more fraught. There are concerns that this emphasis on employability may negatively shape students’ focus on particular aspects of their learning away from critical understanding or the development of prosocial values. There may also be a discrepancy between what employers say they want from graduates and what they claim to actually get. There are a number of ways that psychologists may get involved in helping individuals who are navigating this precarious labour market. There is evidence, from Nele de Cuyper and colleagues, that perceptions of job insecurity impact individuals’ beliefs about their employability, so coaches and counsellors may have a role to play in helping individuals to build a more positive view of themselves. And this has positive impacts for the employers as well: Gail Kinman’s work has suggested that interventions to help build psychological resources such as resilience improve the psychological wellbeing of individuals, but Jessica van Wingerden and her team have found that they improve performance at work too. General career support is likely to help individuals, but Lyndsey Jenkins and Debora Jeske have found that when this is combined with other forms of support (emotional, instrumental and informational) individuals experience a greater sense of their agency in relation to careers and are more engaged with identifying their career interests and choices by interacting with others. Psychologists may also have a role to play in helping individuals to identify the values that they wish to fulfil through work. This might help counter the risk of focusing on instrumental behaviours while developing employability; but focusing on values might also have benefits for employability in itself. Longitudinal research led by Lea Waters has suggested that individuals who are self-directed and value-driven in their career decisions are likely to put more effort into their job search behaviours and are therefore more likely to succeed in reemployment. We can also ask people to imagine successful future versions of themselves at work: a 2012 paper in Journal of Applied Psychology led by Karoline Strauss found that this may promote proactive career behaviour, and thus increase employability. There is therefore a lot that we can do to help individuals navigate the changing world of work. However, given some of the issues we’ve noted, perhaps we should also be asking ourselves whether it is time to resist emerging developments in the labour market? Encouraging a focus on values may be a crucial component of helping individuals in an ethical manner. The knowledge, skills and behaviours that help us meet the challenges of the 21st-century workplace are very different to those required in more ‘traditional’ types of work. We need to be able to work independently and without direct supervision, and to work remotely and flexibly as required. We also need to manage technology, not only for communication purposes but also to help us self-organise our diaries and workloads. Occupational psychologists have a major role to play in helping individuals and organisations develop the flexibility and readiness for change needed to thrive in such a dynamic working environment. From 2014 all UK employees who had worked for their employer for at least 26 weeks became eligible to request flexible working arrangements. Employers are required to consider requests, but can refuse for valid business reasons. Great claims are made for the benefits of flexible working for productivity, wellbeing and work–life balance. Remote working can also aid the green agenda by reducing the need for commuting, and there can be substantial savings on office rent and energy costs. Nonetheless, in terms of the effects on employees, systematic reviews have concluded that any gains from flexible working are modest at best. Indeed, under some conditions, it can intensify stress and increase rather than reduce conflict between work and personal life (see reviews by Kerry Joyce, Clare Bambra and others). It is therefore vital for organisations to be aware of the risks of ‘imposing’ remote working on their employees: choice and control over flexible working options, and support when jobs are redesigned and reconfigured, are vital. Technology can improve work–life balance by allowing people to manage the competing demands of their work and home roles more effectively. As with flexible working, however, there is an increasing recognition that ICT use can threaten as well as enhance employee wellbeing. Being ‘always on’ can extend working hours by making the job role more salient – this limits opportunities to recover from work, with serious implications for productivity and personal relationships. At present most organisations only provide their remote workers with general health and safety guidance, and they are forced to self-manage their ICT use. Many struggle to set limits on their use of technology and feel overwhelmed by the volume of email traffic and the expectations of a rapid response. There is surprisingly little guidance available on how to help people engage with technology in a way that protects their wellbeing and boosts their productivity. A key role for psychologists is to raise awareness of the need to help employees manage ICT use and help them develop strategies to accomplish this. Members of the BPS Division of Occupational Psychology Working Group have recently developed the concept of ‘e-resilience’, referring to the behaviours and environmental interactions that help people engage with ICT in a healthy and sustainable way. Our work has highlighted the importance of individual differences in determining what is ‘healthy’ and ‘unhealthy’ engagement with technology. An important aspect of e-resilience is also a recognition of the need for ‘email and e-communications etiquette’ where employees respect the practices and preferences of colleagues. Building e-resilience in the workforce should be considered a priority by 21st-century organisations. There is no simple solution. ‘Email-free’ days, one day a week when employees are able to talk to each other only face-to-face or on the phone, are increasingly popular. There is evidence that physiological markers of stress are reduced and the quality of working relationships improved on such days. Nonetheless, such measures can be tokenistic, as the rest of the week remains stressful and people may struggle to catch up with their email backlog. Other organisations have banned email outside formal working hours or during holiday periods. Although effective in some working environments, such sweeping measures are likely to be resisted by employees who wish to control their own working patterns and who prefer more integration between their work and personal life. Restricting email use is also likely to disadvantage people who are juggling work and family responsibilities as well as those working across time zones. Nonetheless, there is strong evidence that some disengagement from ICT benefits wellbeing, job performance and personal relationships. People are also becoming more aware of the risks of being ‘always on’. Recent research conducted by Ofcom shows that many of us are taking a digital detox – a self-imposed break from technology in order to refresh our physical, mental and social resources. So who is responsible for helping people achieve a healthy balance between their work and personal life? Rather worryingly, research suggests that the proportion of managers who believe that work–life balance is a ‘private concern’ has grown significantly over the last 10 years. Many organisations are also reluctant to acknowledge the adverse effects of long working hours on the health and productivity of their staff. It is also vital to help organisations pre-empt unintended consequences of any intervention they introduce. Remote working, for example, may reduce organisational costs and remove the stress of commuting, but can lead to social isolation and role stress. There is also evidence that flexible working for family reasons can be stigmatised. Men, in particular, are widely considered to be less committed to their job and less worthy of promotion if they work flexibly – this has recently been termed the ‘price of love’ by Caroline Gattrell and Cary Cooper. Recent studies show that women as well as men, and younger as well as older workers, share these attitudes. We can help organisations manage these risks, reduce the stigma of flexible working and help managers develop the skills required to support remote workers. A ‘virtual coffee machine’, for example, can help e-workers maintain social relationships with colleagues and reduce feelings of isolation. In order to thrive in the face of rapid change, we need to anticipate what work will look like in the future and how it will be organised. We must appreciate the benefits and drawbacks of technology and learn to anticipate change. ‘Vorsprung durch Technik’ (advancement through technology) was the catchphrase of a famous Audi advert. This term seems particularly appropriate now, as we increasingly need people to work with technology to achieve truly flexible and beneficial work practices, rather than be governed by it. Arthur, M.B. & Rousseau, D.M. (1996). In M.B. Arthur & D.M. Rousseau (Eds.) The boundaryless career: A new employment principle for a new organizational era. New York: Oxford University Press. de Cuyper, N., Mäkikangas, A., Kinnunen, U. et al. (2012). Cross-lagged associations between perceived external employability, job insecurity, and exhaustion: Testing gain and loss spirals according to the Conservation of Resources Theory. Journal of Organizational Behavior, 33, 770–788. Hirschi, A., Herrmann, A. & Keller, A.C. (2015). Career adaptivity, adaptability, and adapting: A conceptual and empirical investigation. Journal of Vocational Behavior, 87, 1–10. Inkson, K., Gunz, H., Ganesh, S. & Roper, J. (2012). Boundaryless careers: Bringing back boundaries. Organization Studies, 33(3), 323–340. Kinman, G. & Grant, L. (2011). Exploring stress resilience in trainee social workers: The role of emotional and social competencies. British Journal of Social Work, 41, 261–275. Rodrigues, R.A. & Guest, D. (2010). Have careers become boundaryless? Human Relations, 63(8), 1157–1175. Rothwell, A. & Arnold, J. (2007). Self-perceived employability: Development and validation of a scale. Personnel Review, 36(1), 23–41. Smith, V. (2010). Enhancing employability: Human, cultural, and social capital in an era of turbulent unpredictability. Human Relations, 63(2), 279–303. Strauss, K., Griffin, M.A. & Parker, S.K. (2012). Future work selves: How salient hoped-for identities motivate proactive career behaviors. Journal of Applied Psychology, 97(3), 580–598. Tomlinson, M. (2012). Graduate employability: A review of conceptual and empirical themes. Higher Education Policy, 25, 407–431. van Wingerden, J., Bakker, A.B. & Derks, D. (2016). A test of a job demands-resources intervention. Journal of Managerial Psychology, 31(3), 686–701. Waters, L., Briscoe, J.P., Hall, D.T. & Wang, L. (2014). Protean career attitudes during unemployment and reemployment: A longitudinal perspective. Journal of Vocational Behavior, 84, 405–419.